I’ll cut right to the chase. If you’re not shooting in RAW yet, you should start doing it…yesterday. And once you get the hang of it you will wish you had started earlier. To go over some numbers for illustration, your camera is capturing the lightness information from a scene in 16-bit. 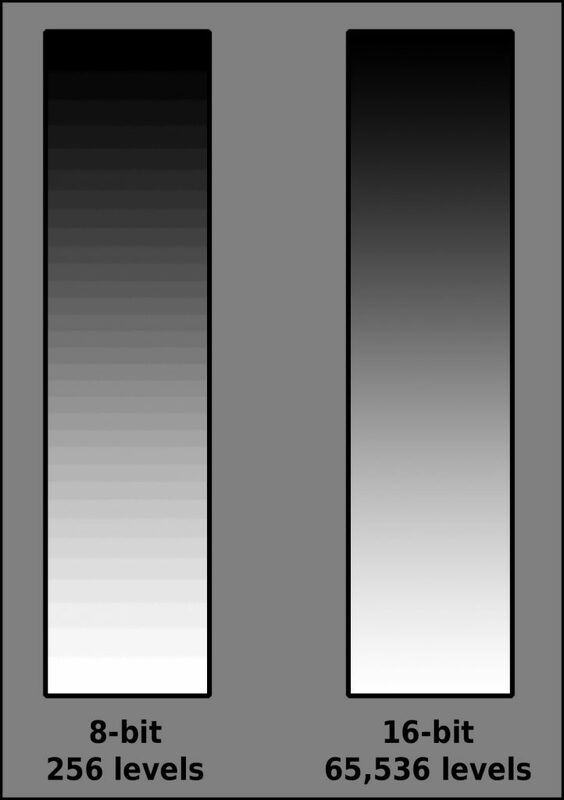 That means that the range of lightness values from the darkest black to the brightest white is 2 raised to the 16th power, or 65,536 (in each color band or in grayscale). But unless you’re shooting in RAW, your camera is only putting out a total of 2 raised to the 8th power (8-bit), or 256 different values per color band. The advantage of shooting in RAW is that if you do your processing in the 16-bit domain, you can recover so much more detail out of your images than the built-in processing can, much the way Ansel Adams and others took a wide dynamic range negative and massaged it to fit a narrow dynamic range piece of paper. The camera manufacturers do a great job of developing processing algorithms for automatic image adjustments for JPG output but when doing your own processing you have so much more control over what your final image looks like. Although you can do some processing on 8-bit JPG images, you can never get close to what you can do with the RAW data from the camera. This graphic demonstrates the difference between 8 and 16-bit information in just a grayscale image. Computer displays cannot truly replicate 16-bit data but this is a representation of how much information you lose by not shooting in RAW. The fine differences get reduced greatly. To think you are being a purist by taking an image directly out of the camera via JPG is to let an algorithm make sharpness, lightness, and contrast decisions for you. The same holds true for taking a RAW image as is, with no processing. ALL images need some adjustments because of the degradation introduced by the lenses and electronics. They are being done on the JPG images, just by generic algorithms any not by you, the one who witnessed the original scene. The tricky part with working with RAW images is that you can’t see the extra data directly because the current display standard can only deal with 8-bit data. 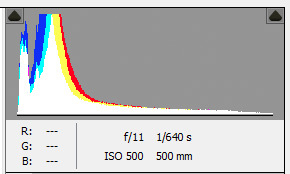 In order to work within the RAW domain, you use the same sort of histogram in your processing software (i.e. LightRoom, Photoshop, Adobe Camera RAW, etc.) that you have in your camera to visualize what’s going on in the image and modify the histograms by way of sliders and numerical inputs, which in turn show up on your screen. With no processing, images look dark and lifeless, the colors are muted, the white balance is off, and although you cannot see the noise, there will be plenty of it evident. All images also need a little bit of sharpening and contrast adjustment. 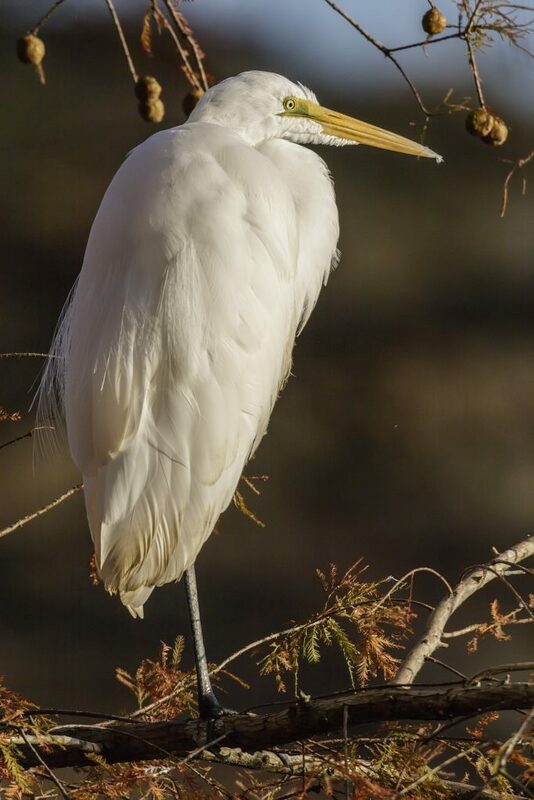 Consider this image of a great egret. Without any processing, the entire image is dark and devoid of any detail, all of which I remember seeing. The white areas should be as bright as they were in the direct sun. When you do your own adjustments, you get to decide what details show up in the highlights and the dark areas. It may seem as if you have created data when you have only optimized the data that the camera had captured. The details that you will see were there all along but they were effectively hidden by the narrow range of lightness values until you pulled them out and decided for yourself how they should fit within the narrower, 8-bit output file. You also get to decide how much sharpening and noise reduction to apply, both of which are necessary to some degree. In the processed image you can see all of what you saw when you viewed the scene. The whites are white and bright and the darks are dark but no so much that the detail is lost. 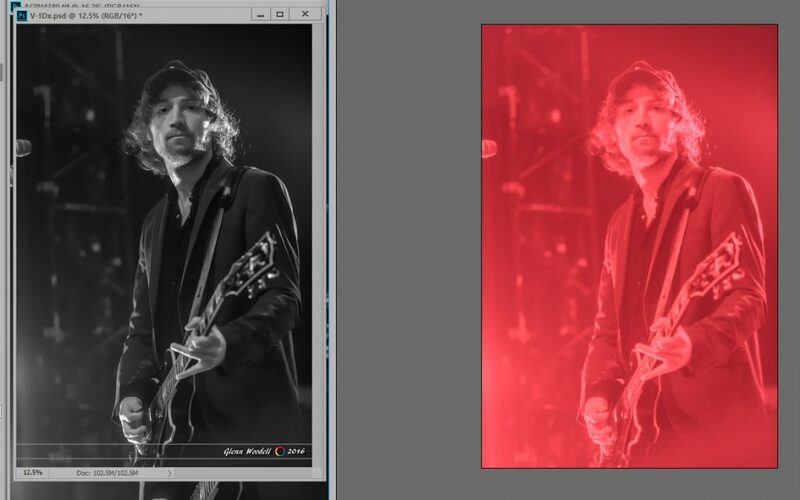 In the live music example below, the scene was monochrome, being lit with only red lights. I decided to turn this into a grayscale image but I was able to do it the way I wanted to – the way I remembered seeing it. I saw all the detail that is seemingly lost in the red, unprocessed version. By working with the data that was already there I was able to produce something that was very close to the original scene, just without the color. People have written books on the subject of processing so I won’t go into any more detail here. Just know that by shooting in your camera’s default JPG format, you are losing precious information that you could have used to make a much more vibrant and dynamic image. If you don’t understand processing software then by all means shoot jpg and have fun. Just don’t lose sight of the full power of photography by doing your own processing. Sure, you can over do it and make things look fake, but at best you want to reproduce the scene as you saw it and not as the algorithms think you did.